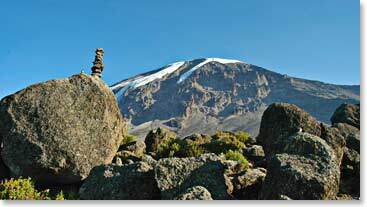 This expedition will be the ultimate experience on Africa’s greatest mountain, Kilimanjaro. Beginning at the rarely visited western edge of Kilimanjaro, we will traverse the wild and unspoiled Shira Plateau and then head towards the crater rim. Once we get to the crater rim of Kilimanjaro, we will actually sleep inside the crater at 18,700 feet and then view the magnificent glaciers that cover Kilimanjaro. Join this adventurous father and son team on their excursion as they give their day to day dispatches of their journey. July 30, 2008 – Safari Proves Bountiful! July 26, 2008 – Summit Success! July 23, 2008 – Day Four and Doing Fantastic!